Bone Waste A vast expanse of sand and salt flats, explored only along the northern fringe. Many dangerous desert-dwelling creatures are known to exist here. A city-state on Seal Bay, population about 10,000, well known for importing exotic herbs and spices from distant lands. City state on the edge of North Plain. This is as far south as snow has been known to fall in winter. Population about 7000. Fishing port on Seal Bay. Population is 2000, mostly halflings and gnomes, plus some exiled elves and a couple of hundred humans. Mineral rich moutains to the west of North Plain. Original home of the dwarves and site of the two oldest-known dwarfholds. 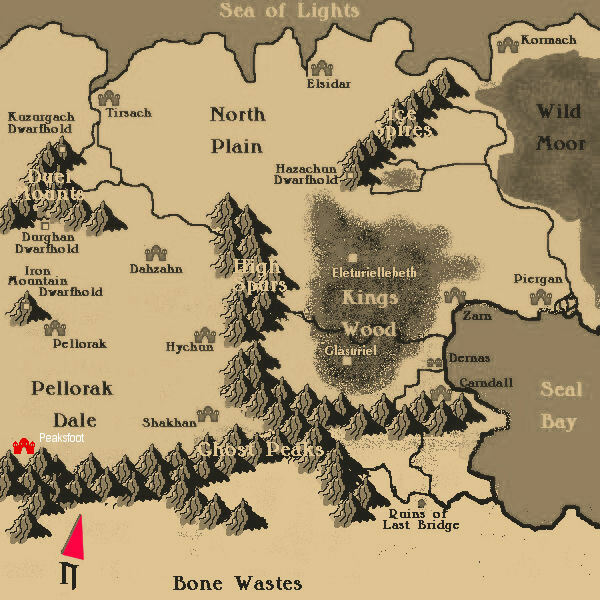 The oldest and largest dwarfhold in existence, Durghan was founded some 3000 years ago, and has a population of about 34,000. Larger of the two elven shees in Kings Wood. The city itself is hidden beneath a tumulus, but claims all the land north of the Kings Wood River. Population is thought to be about 4000 elves, plus several thousand other Fey creatures. Trading port on the coast of the Sea of Lights. The harbour sometimes freezes during the harshest winters. Population is 5000. Extremely high and rugged mountains separating the Young Nations from the Bone Waste. So named because they are often shrouded in cloud and mist, thus appearing ethereal and ghostly. Smaller elven shee in Kings Wood. Glasuriel has a population of abot 2000 elves, plus thousands of other Fey creatures. The city is hidden within a stone circle. A dwarfhold in the Ice Spires, currently under almost constant attack by monsters from farther along the range. Population is about 10,000. Not as high as the neighbouring Ghost Peaks, the High Spurs still represent a formidable barrier. A city of some 7000 souls, just west of the High Spurs, famed for its silks and for providing mercenaries for many other city states. A range of permanently snow-capped mountains marking the eastern end of North Plain. This range has been overrun by humanoids and giant-kin in the last hundred years, and they constantly attack Hazachun Dwarfhold. The newest dwarfhold in the Young Nations. Less than three hundred years old, and with a population of 900, Iron Mountain exports weapons and metal ingots to Pellorak and Shakhan. Named for the two elven kingdoms located within it's boundaries, this is the only sizeable area of forest wthin the Young Nations, any others having been reduced to small coppices and woodlands covering an acre or less scattered across most of the lands. The elves will not permit that here, which can strain relations with nearby human realms. A city state on the coast north of Wild Moor. The city is heavily fortified and employs many mercenaries to defend it from barbarians and monsters coming down from the Moor. Population is about 5000, plus about 6,000 troops. The second oldest dwarfhold. Population is about 20,000. Rumour says that the hold is mined out, and that the population is falling as dwarves move to Iron Mountain. A wide expanse of high quality grazing land, supporting many farms near the cities, and herds of bison, antelope and wild horses out in the wilder areas. The area around Tirsach is famous for breeding warhorses. A city of some 1,500 souls at the base of the Ghost Peaks in the western part of the Young Nations. Peaksfoot carries on extensive trade with Pellorak. Pellorak A city of some 5000 souls just south of Iron Mountain. Pellorak is famous for its horse market, where they sell the famous Pellorian breed. An area of warm grassland where horse nomads breed the famous Pellorian, an intelligent fast-paced riding animal, which sells for premium prices in the cities of Pellorak and Shakhan. A fortified city on Seal Bay near the Wild Moor. While not under so much pressure as Kormach, Piergan supports some 2500 mercenaries in addition to its populace of 3000. Piergan is a centre of trade and commerce, both by ship, and overland by merchant caravan. Last Bridge was a thriving town until some 200 years ago when it was attacked by successive waves of orcs coming down from the southern spur of the Ghost Peaks. The town now lies in ruins, but still nobody knows what drove the orcs into the Bone Waste. A large cold sea north of the Young Nations, home to whales, seals and sea monsters. Named for the fact that on clear, calm nights the Northern Aurora can be seen reflecting in the water. A warmer area of sea, southeast of the Young Nations, a well-known breeding ground for seals and dolphins, and the sharks that feed on them. Merfolk trade with the land dwellers at Zarn and Piergan. A walled city with some 15,000 inhabitants to the east of Pellorak Dale. There is a monthly horse market (often selling Pellorians), and regular specialist markets for various trades. Merchant caravans arrive here daily, but the city's main claim to fame are the silvered towers favoured by her nobles, which give the city its nickname, Shakhan of the Silver Spires. Tirsach is well known for breeding warhorses. About 6000 people live within the high walls of this grim city. A bleak, cold expanse of low hills, bare granite outcrops, and terrible weather. If it's not snowing here, it's raining, but (perhaps surprisingly) there are people here. Hardy barbarian clans, humanoids, giants, trolls, and other monsters thrive here. Zarn The major ship building centre in the Young Nations. After years of disputes, Zarn has finally worked out a logging treaty with Eleturiellebeth. For every tree that is cut down in the Kings Wood, Zarn has agreed to plant two. This agreement has been in force for some twenty years, and seems to be working well. Zarn has a population of 5000 humans, gnomes and halflings.